Fits gastric emptying time series from MRI or scintigraphic measurements using nonlinear mixed-model population fits with 'nlme' and Bayesian methods with Stan; computes derived parameters such as t50 and AUC. 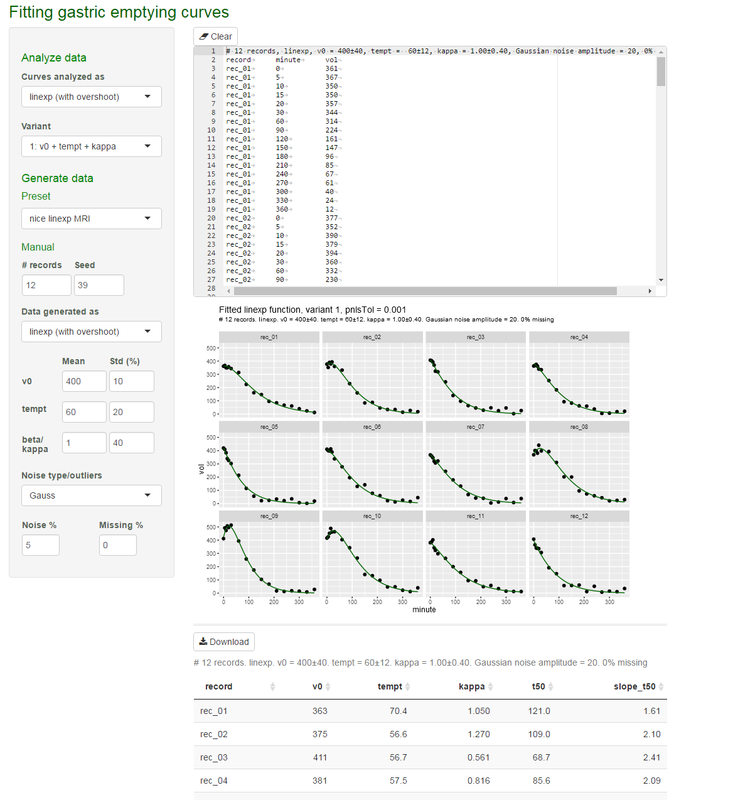 A package and a Shiny web application to create simulated gastric emptying data, and to analyze gastric emptying from clinical studies using a population fit with R and package nlme. In addition,Bayesian fits with Stan to handle critical cases are implemented. Compilation of the Stan models needs several minutes. The web interface can be installed on your computer, or run as web app. linexp, vol = v0 * (1 + kappa * t / tempt) * exp(-t / tempt):Recommended for gastric emptying curves with an initial volume overshoot from secretion. With parameter kappa > 1, there is a maximum after t=0. When all emptying curves start with a steep drop, this model can be difficult to fit. powexp, vol = v0 * exp(-(t / tempt) ^ beta): The power exponential function introduced by Elashof et. al. to fit scintigraphic emptying data; this type of data does not have an initial overshoot by design. Compared to the linexp model, fitting powexp is more reliable and rarely fails to converge in the presence of noise and outliers. The power exponential can be useful with MRI data when there is an unusual late phase in emptying. Population fits based on function nlme in package R nlme. Stan-based fits, both without and with covariance estimation. Thanks to priors, fitting with Bayesian methods also works for single records, even if stability strongly improves with more data sets available; see stan_gastempt. Some details can be found in my blog. The rationale for using Stan to fit non-linear curves is discussed here for 13C breath test data, but is equally valid for gastric emptying data. Data can be entered directly from the clipboard copied from Excel, or can be simulated using a Shiny app. Robustness of models can be tested by manipulating noise quality and between-subject variance. Fits are displayed with data. The coefficients of the analysis including t50 and the slope in t50 can be downloaded in .csv format. Post-hoc analysis in Shiny application by treatment groups, both for cross-over and fully randomized designs.